I hope the feeling of shooting somewhere new never gets old! Ohio City in Cleveland is one of the best photo locations in our area (I'm an expert). There are SO MANY different spots that make such gorgeous backgrounds!! We probably only covered 4 blocks, but we were stopping every 10 steps! The best part? 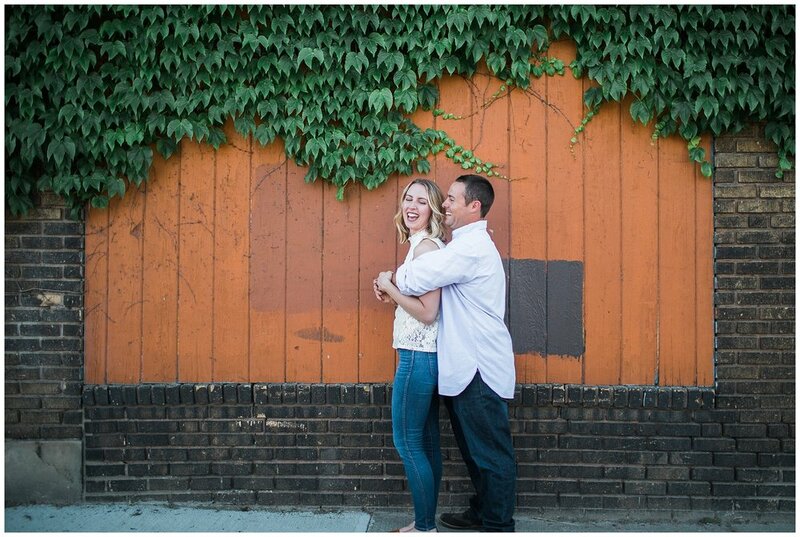 Kelsey & Mike welcomed every stop, even though it was incredibly hot outside and the Cavs were playing that night! We decided on Cleveland because Kelsey wanted photos with some murals, and I agreed! I love all the color and texture it adds!! If you've been to Ohio City recently you may have noticed all the new murals pooping up everywhere, an initiative by the Cleveland Foundation's Creative Fusion program in hopes of brightening up the city. Cleveland was picked as one of 5 cities to be part of Instagram’s Kind Comments Campaign in celebration of Pride month, and I fell in love with this mural done by Erin Guido and Joe Lanzilotta. The “love doves” celebrate the foundation of my business: love, in all its forms. I don’t think it gets much better!